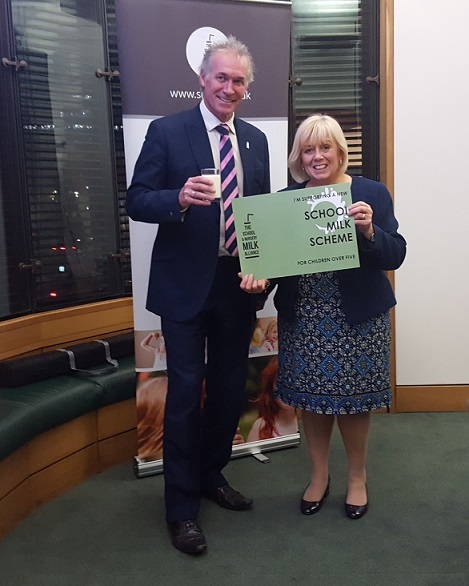 The School and Nursery Milk Alliance (SNMA) held an event to show support for a replacement EU milk scheme. The Department for Environment, Food and Rural Affairs (DEFRA) has made some positive indications to the SNMA about the future of the milk scheme. However, with Brexit looming, we still await confirmation of a replacement scheme. Currently, children over five years can access subsidised milk through a scheme funded by the European Union. The UK received €4,219,008 funding towards this during 2017. The SNMA event was hosted by Labour MP and long-time supporter of the scheme Mary Glindon and featured Dr Hilary Jones. Nine Parliamentarians came along to support the campaign and learn about childhood obesity and dental decay, within their constituencies.